We believe we will never win better rights for tenants unless we are all working together and raising our voices. Recent FTMA activism news is below and you can follow the links to the right to get involved. Nelson Clarke was one of the main founders of the FMTA. A tenant from the 42 Glen Elm Tenant Association faces talks about what it's like to face the prospect of years of Above Guideline Rent Increases. In April 2016, the Ministry of Municipal Affairs and Housing released a consultation paper which discussed Proposals to Encourage Small Landlords to Provide Rental Housing. Thorncliffe Park Tenants Walk in Support of Landlord Licensing! Join Them on May 29! Thorncliffe Park Tenants Association would like to cordially invite you to our upcoming community event. The petition below notes that Above Guideline Increases (AGI's) for renters are taking it's toll on seniors, people on other fixed incomes and those who are struggling to make ends meet by working two or more jobs. For example in the last thirteen years, the Brentwood Towers landlord alone, applied for and received AGI's nine times. 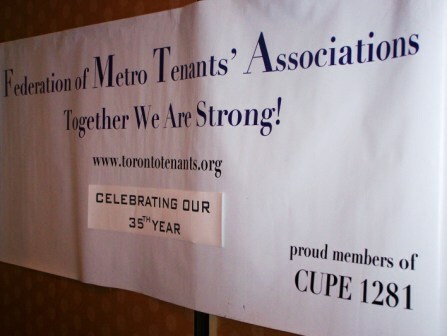 Canada's oldest and largest tenant federation is accepting new volunteers! Throughout FMTA's history, volunteers have formed the backbone of the Federation by volunteering through our affiliated tenant associations and through our board of directors. Learn more about these volunteer activities here. National Housing Day Rally in Toronto on Tuesday, November 22, 2011! voteforhousing.ca - up and running! The Vote for Housing website www.voteforhousing.ca is now up and running. You can find the four housing fact sheets, September 8 housing debate flyer and Vote for Housing's Statement on Livable and Affordable Housing for candidates and parties on the site. Keep Toronto a Quality City! Depute at City Committees! The City of Toronto is currently reviewing consultant reports which they have commissioned to find savings in the Toronto City budget. The City is facing a shortfall between $400-$750 million for next years budget.